The new medical center, designed by the Phoenix-based Architect, Devenney Group Ltd., will include all private rooms within the hospital, as well as a Level 2 Trauma 20-bed Emergency Department, Diagnostic Imaging, Interventional Services, Intensive Care and Women’s Services. An official groundbreaking ceremony was held on Wed., July 1, the same day DPR began demolition of a vacant apartment building located on site, and construction crews are currently clearing away deconstruction debris, as well as working on the relocation of the helipad. Value Stream Mapping, a lean tool, which the IPD team used to plan and streamline the design process. The result: Typical time to design a comparable facility is 24 months. The team delivered complete designs in 15.5 months to meet regulatory deadlines for an on-schedule construction start. BIM used to coordinate all elements of the project virtually and maximize the offsite fabrication and pre-assembly. In addition, DPR is using model-based estimating, allowing estimates to be generated rapidly and giving the team greater access to real-time cost information. The first new medical center in Alameda County to be built in compliance with California’s earthquake safety law, SB 1953, the project is also one of the first to use California Office of Statewide Health Planning and Development’s (OSHPD) phased plan review system. Using this system, the team is accelerating the permitting process and overall schedule by nearly 12 months. 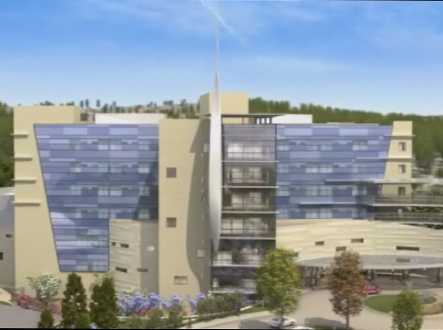 With an anticipated hospital opening scheduled for January 2013, the project will have up to 350 people working on site at the height of construction over the next three years. Following the opening of the new facility, DPR will begin demolition of the adjacent existing hospital, which will remain fully operational throughout the Sutter Medical Center, Castro Valley project.